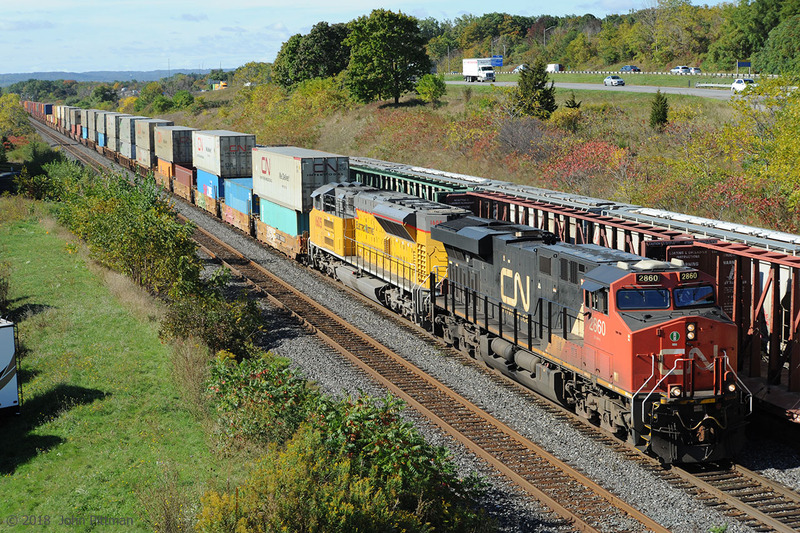 Railpictures.ca - John Pittman Photo: CN container train 148 has ES44ac CN 2860 in the lead. It’s the second unit that is interesting – EMDX 1605, painted in Union Pacific colours, is one of EMD’s Tier 4 demonstrator units. Hood-side lettering beneath ELECTRO-MOTIVE reads THE NEXT GENERATION OF PROGRESS ## SD70ACe-T4 While EMD has labelled the locomotive as a member of the SD70 family, the prime mover is very different. Apparently the 2-stroke EMD 16-710 diesel engine, as used in other SD70′s, could not be adapted into a practical Tier 4 compliant engine. Instead the locomotive is powered by a 12-1010J 4-stroke diesel engine rated at 4600 HP, developed from the 16 cylinder 265H 4-stroke diesel that was the intended power for EMD’s SD90MAC-H. Web sources indicate that UP ordered 88 SD70ACe-T4 and has a number of them in service, while Norfolk Southern had 10 on order as of August 2018. There are 3 trains on the 4 tracks in this picture: Track 3 is unoccupied, CN 148 is on Track 2, CN 422 is on track 1, and CN 421 is on the Aldershot Yard west end lead. | Railpictures.ca – Canadian Railway Photography – photographie ferroviaire Canadienne. While EMD has labelled the locomotive as a member of the SD70 family, the prime mover is very different. Apparently the 2-stroke EMD 16-710 diesel engine, as used in other SD70's, could not be adapted into a practical Tier 4 compliant engine. Instead the locomotive is powered by a 12-1010J 4-stroke diesel engine rated at 4600 HP, developed from the 16 cylinder 265H 4-stroke diesel that was the intended power for EMD's SD90MAC-H. Web sources indicate that UP ordered 88 SD70ACe-T4 and has a number of them in service, while Norfolk Southern had 10 on order as of August 2018. There are 3 trains on the 4 tracks in this picture: Track 3 is unoccupied, CN 148 is on Track 2, CN 422 is on track 1, and CN 421 is on the Aldershot Yard west end lead. The rads look familiar but are actually quite different. Great that you caught a picture of this. Maybe CN will pickup a few also.